I’ll keep this review small and simple, which seems apt as that’s how this fantastic little book could be described as well. One of the best features of this book is how each recipe is written with simple step-by-step instructions and is accompanied by a full-colour photograph, so you can cook with confidence knowing what the cake you’re trying to bake should look like when it’s done. 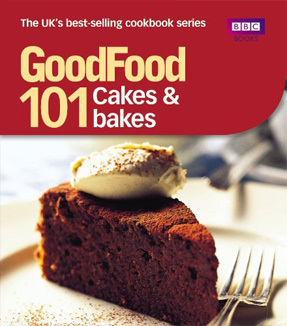 Another good thing about this little cake book is that there’s a large variety in the type of things you can bake – recipes range from cakes, cookies, brownies, muffins, flapjacks and loads more! I’ve got a few books where it’s practically just the same recipe over and over again with just a different kind of topping. The 101 Cakes and bakes has so many different recipes there’s bound to be something for everyone.